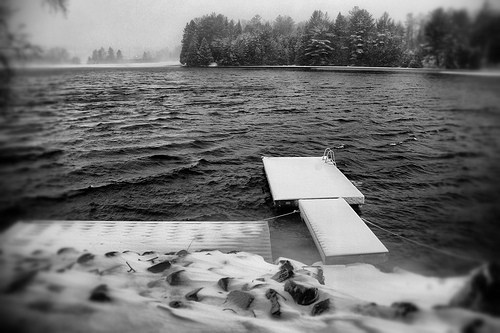 Stormy winter morning at the cottage. This morning I bring you a post from the cottage, where we’re cozied up by the fire enjoying the forces of nature around us. We arrived on Friday night after driving through steady, sticky snowfall, and Saturday turned out to be a sloshy warm day, perfect for building snowmen and forts out of the relatively fresh snow. This morning I took Luna out for a walk in blustery but warm winter winds. But the mild weather is about to turn — according to the forecast, here in Coby it will drop to -21°C by the evening, and remain frigid for the rest of the week. Brrr! 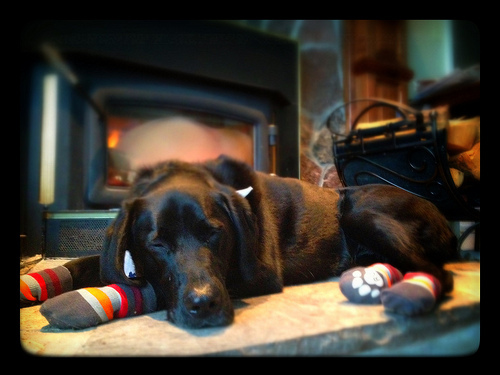 Luna by the Fire – photo taken by Chris. We decided to come up here this weekend to relax after a week and a half of a roller coaster real estate ride that isn’t over yet. We have big news, but I’m going to wait to share until all our ducks are lined up, which we hope to have figured out about a week from now. I know, I’m such a tease. Stay tuned! Previous Post I can ski. I’m a skier! Where did you get Luna’s boots? More socks than boots, but they’re pretty great. She pulls them off now and then when she steps on them but they generally stay on pretty good.